Collection of photographs and postcards of Greer from the South Carolina Room Archives and the Greer Heritage Museum. Greer owes its creation to the Southern Railroad. James Manning Greer owned a 200-acre farm where the heart of Greer stands today. In the mid-1800s, he traded a few acres to the railroad company and sold the rest of W.T. Shumate who began selling lots anticipating economic growth around the train station. The post office at the train station was known as “Greer’s Depot” and the name stuck. In the early 1900s, the ‘S’ was dropped from the name and a second railroad laid tracks through Greer. 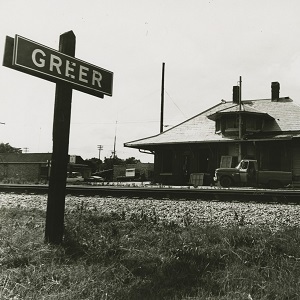 With two active railroads, Greer attracted a variety of industries including textile mills, peach orchards, and Homelite. Today the Greenville-Spartanburg Airport, BMW plant, and inland port continue to help the small town thrive.